The group are travelling with the charity Chernobyl Children International. 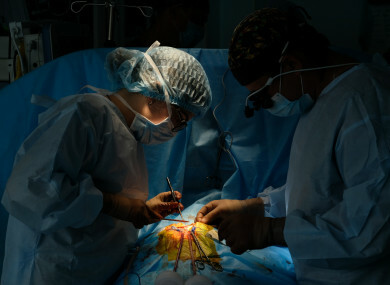 A TEAM OF Irish-funded doctors have travelled to Kharkiv in eastern Ukraine this weekend to perform life-saving surgeries for children affected by the Chernobyl disaster. But the group, who are travelling with the charity Chernobyl Children International, did not have an easy passage because of an ongoing conflict in involving Russian separatists in the region. The area, which is under martial law, has seen daily exchanges between Ukrainian government troops and pro-Russian militias who have de facto control of border areas. “History has a habit of repeating itself, but I didn’t expect the repetition so quickly,” Dr William Novick, one of those travelling, tells TheJournal.ie. In 1986, a catastrophic nuclear accident occurred at a power station in Chernobyl, releasing huge amounts of radioactive material into the environment. The disaster led to the creation of a 30km exclusion zone around the station, as well as long-term health effects on those who lived in the region, including fatal cancers. One of these conditions ‘Chernobyl Heart’, affects children born in the region whose bodies absorb radioactive material as they develop. 6,000 babies are born with heart defects in the country every year, and they suffer from a range of health effects, including high blood pressure and holes in their hearts. To assist them, the Irish-funded doctors have travelled to perform life-saving operations on babies as young as one day old who live in towns and villages affected by the accident. For Novick, however, their journey this week has recalled previous missions by the group. “It was not too long ago when politics and egos tried to disrupt our mission to help the children with heart defects,” he recalls. In 2014, violence in the area forced the charity to suspend surgeries for Chernobyl’s youngest victims. However, the group’s founder Adi Roche said despite the risks involved, the team has assessed the situation and feels that their role is too important not to travel. “The reality is that one in every four children diagnosed with the heart defect known as ‘Chernobyl Heart’ will die before they reach the age of six,” she said. She added that while the atmosphere in Ukraine is still volatile, the team will continue the work it has been doing in the country for the past 14 years while it can. Email “'Families need a Christmas miracle': Irish-funded doctors to help Chernobyl babies in war-torn Ukraine”. Feedback on “'Families need a Christmas miracle': Irish-funded doctors to help Chernobyl babies in war-torn Ukraine”.